The Arab Spring was a series of seismic, historic events. But 2012 shows the term itself is no longer a useful description. Spring implies a summer and a winter to follow – neither season is an apt adjective. And can we really club the Arab world together under one banner? Each country has undergone its own revolution and is moving on its own divergent trajectory. That trend will accelerate in 2013. Economists point to one factor that influences countries in the Middle East and North Africa above all others: oil. Consider that of all the regimes to fall during the Arab revolutions of the last two years, not a single one was an oil exporter. Petro-states have the funds to keep their people satisfied. So I was surprised when I looked at the International Monetary Fund’s latest growth outlook. It projects that the region’s oil exporters (Iran, Saudi Arabia, Algeria, United Arab Emirates, Qatar, Kuwait, Iraq) will have grown by 5.3 percent in 2012. Oil importers (Egypt, Morocco, Tunisia, Sudan, Lebanon, Jordan) will have grown only 1.2 percent. But come 2013, that disparity will shift. The IMF projects that oil exporters will slow to 3.8 percent growth while oil importers will speed up to 3.3 percent growth. A number of factors are in play. Leaders of oil-rich states may have survived a period of political turmoil by throwing money at the problem, but they now have to deal with budgets full of unsustainable subsidies and wage bills. They are also hostage to global oil prices like never before – they need crude to sell for record highs simply to break even. While crude oil averaged above $100 a barrel in 2012 (the highest such average in history, even when adjusted for inflation), sluggish global growth could result in a fall in 2013. That could have dramatic implications for a number of countries. Perhaps Bahrain, maybe Kuwait, possibly even Saudi Arabia – it would not be a huge surprise if one of these countries were to experience some of the protests they have so far been able to stave off. More from CNN: What's next for Syria? Two countries especially will have an important year. Most seasoned analysts expected Syria’s Bashar al-Assad to fall in 2012. He remains defiant. But tens of thousands of deaths later, it seems global opinion is coalescing around the need for an intervention of some sort. Even Moscow’s support for al-Assad has wavered. 2013 will see tumultuous change in Syria, but who or what will replace the current status quo is, frankly, still an utter mystery. The other country that will have another turbulent year is Egypt. One big change we could see is in the way people protest. Demonstrations in Tahrir Square led to Hosni Mubarak’s ouster; but to shape the direction their new government heads in, Egyptians will need to do more than just protest – they’ll need to get involved in finding solutions to Egypt’s problems. And what of the two larger – and enduring – political questions of the region? The Israeli-Palestinian issue (at least, up until the last couple of months) and Iran’s nuclear ambitions have lost some prominence, perhaps in part because of the magnitude of the Arab revolutions. But 2013 will see these two issues back on the front pages because of leadership changes. Israel will hold elections this month; Prime Minister Benjamin Netanyahu will likely win once again, but watch the coalition numbers closely to see how he will interpret his mandate. Iran, meanwhile, will say goodbye to President Mahmoud Ahmadinejad in June. His replacement will almost certainly be a less bombastic and combative leader. Expect someone much more pliant to the mullahs. Iran’s year will not simply be electoral change; it is not far fetched to imagine populist resistance against the regime. Perhaps never before in the history of the world have so many countries colluded to sanction one state – on trade, travel, politics, finance – to such devastating effect. The great question of Iran’s 2013 election will be this: will Iranians blame their fiscal predicament on their own leaders, or on the rest of the world? The answer to that question will be one of the most intriguing issues of the year. « Previous entryCan America be fixed? Don't waste your opportunty as senior producer to rewrite history! You forgot to mention fallen oil-exporter regime libya, which didn't fit your argument. And when you say that oil exporters have money, many of them also have US bases and military hardware. It would not be a huge surprise if Bahrain were to 'experience' protest, but it would be if you were to report it! America's oil reserves are growing. 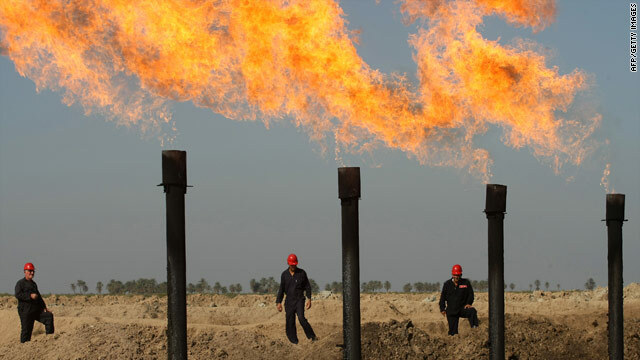 Very soon, it will upbeat Middle-East oil reserves. However, oil will be out of the equations, if we consider the current Military build-up that are going on in Middle-East, by Russia and U.S.; in Europe Missile shields; and China's economic interests and Militarily strengths, mainly inn Africa. The whole Continents of the World are fenced and surrounded by WMD and several heavy Weapons. It seems, WMD production is the fastest growing than oil production. 12 1 = ? (Bad luck). I never see that # in any elevator. As anyone with half a brain would know, if the Middle East didn't have a huge abundance of oil and it does, neither the U.S. nor any of it's crony NATO allies would be involved at all with that part of the world. That's why we invaded Iraq in 2003 and this may well plunge the U.S. and Iran headlong into war! However, although Afghanistan doesn't have much oil, it does have a huge amount of underground minerals which the West largely covets! The security and stability of those oil-rich states rest on a basic assumption. Their governments, run by royal families, have a social contract with the people. Their myopic tenet is "In return for your acquiescence we will provide health, education, water, energy and other services virtually free." But they have overseen questions like, what would happen if they are no longer able to fulfil their side of the contract? What would happen if the cost of subsidising all these benefits became too costly to be sustainable? Somewhat naive article. Did the author consider the impact of FOOD COSTS ? I thought the Egyptian Spring was the direct result of food cost increases and desperation of the young-no jobs, no opportunities for the educated class. It seems to be a world wide problem. The big food producers are manipulating the market besides the obvious droughts that raised the cost of wheat ,which is fueling the unrest. More of that to come in the near future. It is sad, that because of all the media lies, most people including so called Think Tanks are so brainwshed that their brains have become a kaleidoscope of contradictory nonsense and our leadership is ill advised resulting in bankrupcy . This article seems to be a good example of the confusion. Exposing the media lies and showing the public the truth can be helpful towards a better future. Another good post. Thank you, rightospeak. Egypt will see food riots and famines soon. The Syrian civil war started out as food price protests. The Tunisian uprising started as food price protests. None of these places has either the ability nor the desire to address that fundamental problem. The writer states that all of the Middle Eastern states to fall were oil importers and that no oil exporting governments fell. I believe Libya was an oil exporter and It now has a new government.